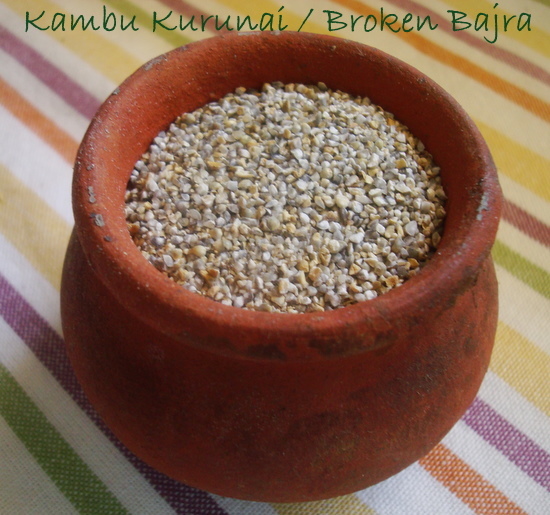 Kambu or Pearl Millet as called in English is a Cereal Kind, Consumed in Tamil Nadu, we have it as Kamban Koozh, its a very common Break-fast among the field workers in village's. Find the Nutritional Values of Bajra / Pearl Millet / Sajjalu(as called in Telugu lang.) / Sajje(as called in Kannada lang.) Here. When i want to cut Rice for a Day, i decided to make Oats for Break-fast and Kambu Sadham / Pearl Millet Rice for Lunch and Roti's for Dinner. I will post the Oats Break-fast recipe next. Now Coming to this Kambu Koozh, it is cooked as Rice and then mixed with Buttermilk. First Boil the Water in a Thick Bottomed Vessel. Put the Broken Bajra/ Kambu in a Collander / Vadikatti and wash them. when the water boil's add the Kambu to the water and let it cook in medium flame for about 10-15 minute's. Now after the Kambu got cooked, let it cool and mix with Butter Milk and salt to taste. Now the Koozh is Ready. eat along with small onions. 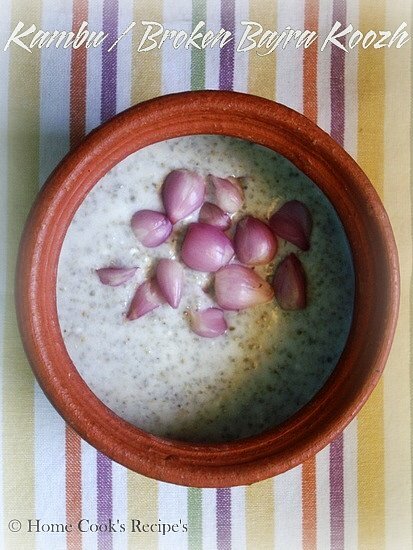 The sweet taste of the onions with the sourness of buttermilk, this Kambu Koozh tastes extremely Good. 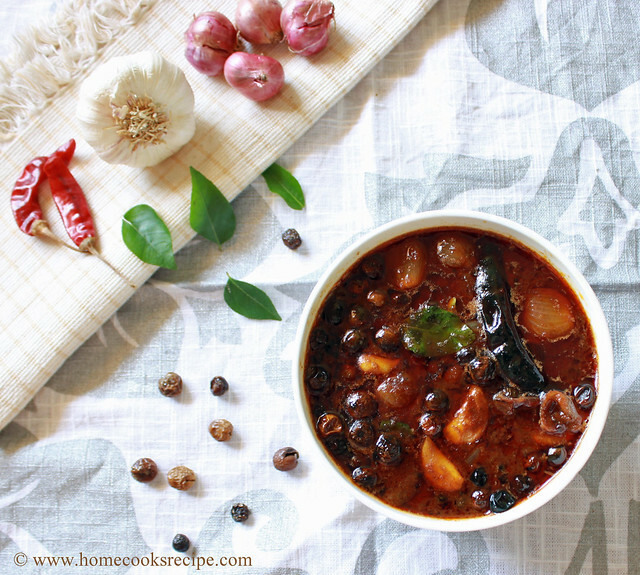 So when this Kambu is Good for Health, why not Cut Rice for a Meal and eat this Kambu Koozh?? * If you are not accessible to Broken Bajra and you are left with whole Bajra's then, you can sprinkle some water over the bajra's and leave it for 15 minute's. then grind them in your mixer grinder. just 1 or 2 pulse is enough. then you can wash the grinded bajra's with water and use it as broken bajra's. * Kambu Generates Heat. so its must to consume along with Buttermilk and small onions or Onions. Baking Cake is very easy, when you know, how the cake batter should be in consistency, before putting into oven for baking. and the next very important point is to measure and add the ingredients as in the recipe. If you follow these simple two tricks, you can master the Cake Making in couple of trials. Chocolate Cake should be moist, it should have red velvetty texture-that comes as a chemical reaction, when the cocoa powder mixes with the sour thing like vinegar or lime juice or Buttermilk. Though this post may sound silly. But for some people, who are hooked to pizza hut stuff's like me, will sure Enjoy this Post. Ever since i discovered Round shaped Breads (Roundels) at Spencers Daily, I was thinking of preparing these Garlic Bread Exotica to my Family. Finally managed to prepare these this week. If you Could not find Round shaped Bread's, then Cut the Sandwich Bread in Round shape. Iam sure it will also turn good. Chop the Onion, Tomato and Capsicum into small cubes. Finely Chop the Green Chilli. Mix the chopped onion, tomato, capsicum and green chilli together. add little salt to taste to veggies and mix well.You can also add chopped Olives to it. Apply butter on one side of the breads and toast them in a Pan on medium flame. 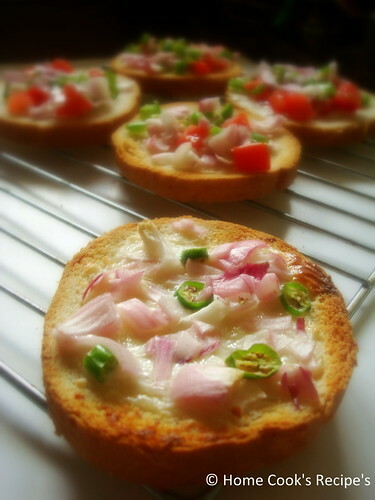 To the other side of the Bread, spread the garlic cheese and spoon in some veggies over the cheese spread on bread. Place the Breads in tawa, with the toasted side facing the tawa. close the tawa with a lid and let the bread get toasted for 2-3 minutes at slow flame. or Grill / Broil the Breads at 250C / 500F for 3-5 minutes. After Grilling, let it cool for 2 minutes and serve Hot. It tastes Great With Soups. 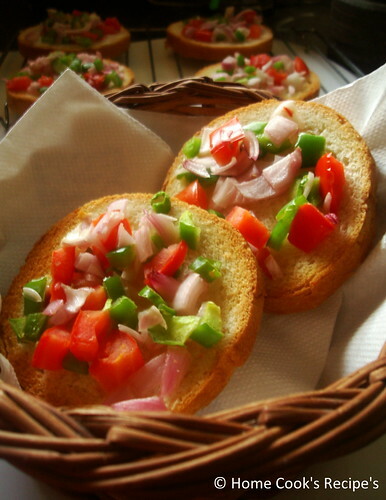 Iam Sure, This will be a stunning appetizer's in Party. I prepared these Breads, without the cheese spread, and i liked this way much. * Avoid Green Chilli's, as they may bite it. Little Pepper Powder can also be used instead of chilli's. * You can also add cooked sweet corn kernels along the veggies. I should have made this post a week ago, but i could not manage to sit and write, as the Summer is So So Hot here in Chennai. Only if i post this Paneer Tikka Masala, my mind would think of Cooking or Making other post. So Here Iam with that Compulsion. 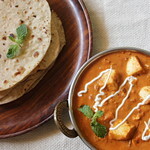 There are two inspirations for me to try Paneer Tikka Masala. One. I read a recipe for PTM(Paneer Tikka Masala) in Aval Vikatan and Two. 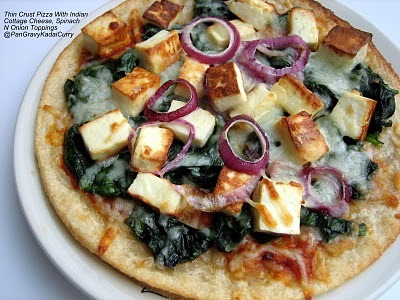 Bharathy's Paneer Tikka Pizza caught my eye. I mixed the both recipe's as far as i can and brought a Perfect Recipe for PTM. Paneer Tikka's tasted so Good as such than in the Gravy. so this is certainly a Keeper Recipe for Paneer Tikka's. Tikka is referred to the pieces of Food, that is marinated with Curd and cooked. 1. You need to have Thick Curd to prepare these Tikka's. So Drain the Curd / Yogurt in a muslin cloth or cotton cloth for about 2 hrs atleast. But what i did is, i drained the water content in curd and squeezed the curd on cotton cloth furthur to drain it completely. as a end result, i got a very thick curd, i spooned out the cotton cloth to get the thick Curd. 2. Cut the Paneer into strip's or cubes. Mix the thick Curd, Ginger Garlic Paste, Chilli Powder, Garam Masala and Salt to taste together. 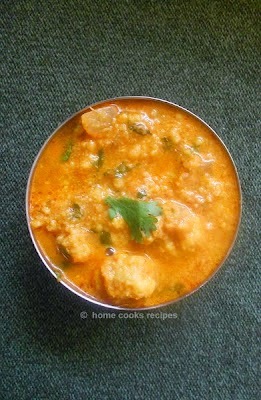 add Paneer Cubes to the masala's mixed and mix well, so that all the paneer cubes are well coated with the Masala. 3. Refrigerate the Marinating Paneer with the Masala's for 3 hours. Marinating Overnight is also welcome. 4. If you have a Oven, Arrange the Paneer Strip's in a Greased Foil sheet. Pre-Heat the oven and Grill / Broil the Marinated Paneer for 10 - 15 minutes at 500F / 250C. till the Paneer turn into Golden Colour. 5. To Prepare in the Tava / Dosa Kal, Heat the Tava and arrange the Marinated Paneer Cubes(5 to 7) for a shift and roast the Paneer in medium Heat. add oil on side's of the Paneer and turn upside down, to roast the other side too. If you want to Grill the Paneer Tikka's in a skewer, with Capsicum, Onion and Tomato. 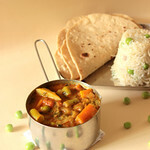 Insert a Paneer Cube, a small onion, a tomato piece, a capsicum and a Paneer cube. Follow the order and grill at the above specified temperature. Now Paneer Tikka's are Ready. Heat Oil in a Pan. Add a diced Onion and saute it, till it turns translucent. add chopped Tomatoes and Green Chilli. saute them for 2 - 3 minutes. add the Cashews, the Chilli Powder, Garam Masala and salt to taste.Let them all get mix well. Cool them down and Grind into a Fine Paste with little water added. Heat the Pan and add the Grounded paste and let it Boil. 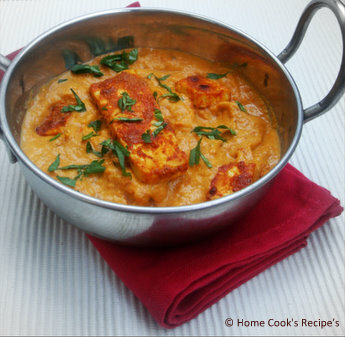 add the Grilled Paneer cube's to the masala, just before serving and Serve with Chapathi's or Vegetable Pulao. 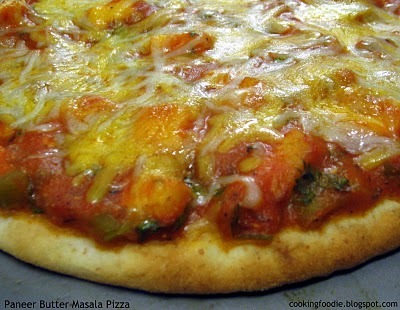 I Prepared Paneer Tikka Masala Pizza for Indian Flavoured Pizza's. I applied oil on both sides of the pizza base and spreaded the gravy of Paneer Tikka Masala over the base. then arranged the grilled Paneer Tikka's over the Gravy on base. arranged few capsicum slices and added mozarella cheese to the toppings. and baked the pizza at 200C for 15 minutes. 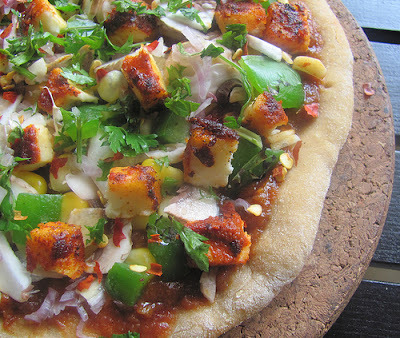 Have a Look at the Paneer Tikka Pizza.. This was the best event i hosted here. Thank You very Much Cilantro, for the opportunity. Each entry reached me with a creative edge on it. You All should check and encourage my creative buddies, for sending me such Lovely, Pizza's. I received few Special entries from Special Friend's. Thanks You Dear's. 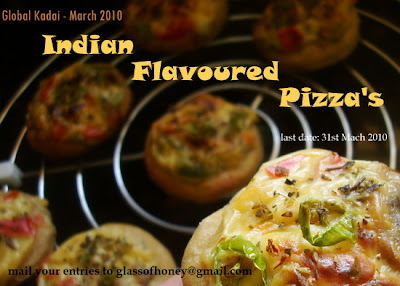 Iam sure, Friends who send me their entries, certainly enjoyed the event, as the theme Indian Flavored Pizza's is an Enjoyable Theme. Dont you agree? Here Iam presenting the Roundup with Full energy, which i got when preparing for the Roundup. 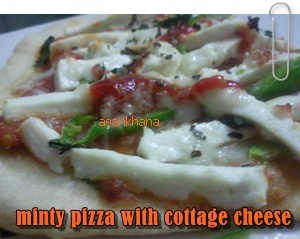 Common Energise Yourself.......Lets Start..
Shri made Palak Khumb Pizza. Absolutely healthy and tempting pizza from you Shri. 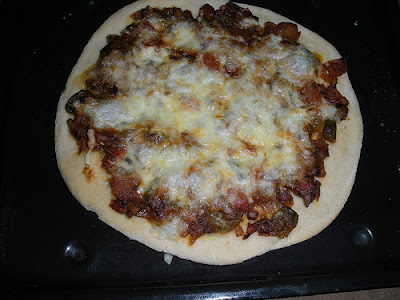 Vaishali made Baghare Baingan Naan Pizza. 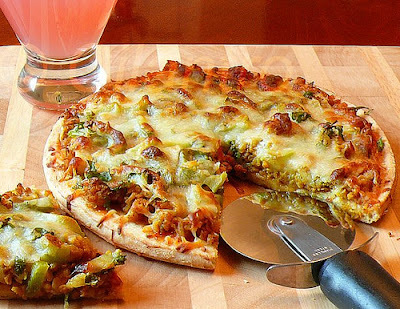 Look at the Baghare Baingan Masala and fall in love with this special pizza sent for me. Bharathy’s Homemade Pizza with Desi Ghee, Tulsi(Basil) and Paneer Tikka masala. 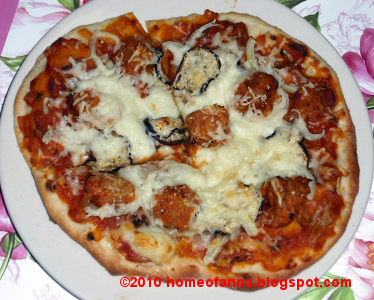 (a perfect Desi Pizza Combo) I tasted these Specially made Pizza, virtually and relished it!! Rak’s Homemade Pizza. If you are looking for “How to make Pizza base and toppings spread at home”, then your destination should be here. She explains brilliantly with Step wise Pictures. Already she made few bloggers try her pizza. Cilantro, the brain behind the Global Kadai, made Pizza with Soy Granules. She made these healthy Pizza. Iam sure, this could be a great way to make Kids eat Soy. 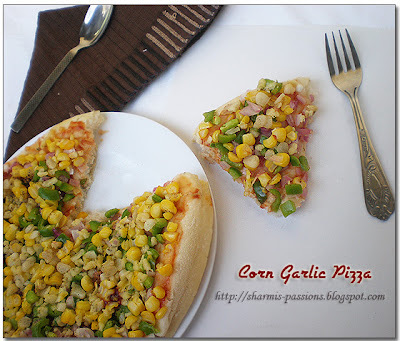 Sharmilee, The Health Conscious Girl makes Sweet Corn Pizza. 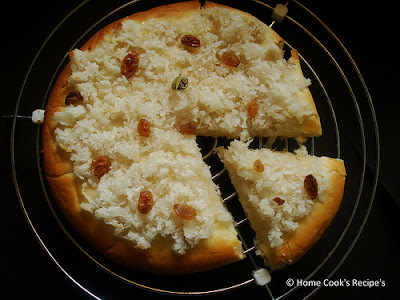 Prema made Indian Herbal Pizza with bitter Gourd’s. 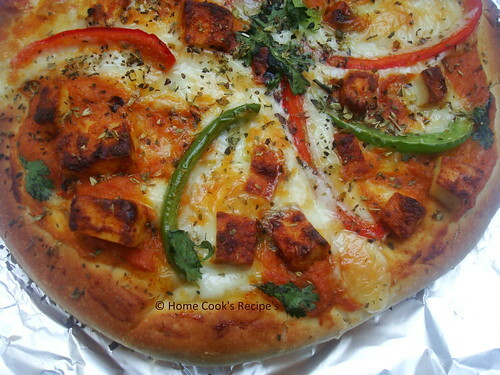 Sowmya made Veggie Pizza with Paneer, Mushroom and Capsicum. SORRY..Yet to publish the post!! Hope You all enjoyed the Roundup. Do try some Pizza's from here in your Kitchen and let us know about it. Do Check the next Global Kadai Edition - Indian Flavored Burritos / Wraps, hosted by Dear Divya of Dilse.